Do you feel tired with your hand when you watch tv or play games, holding your phone for a period of time? Works in landscape and portrait modes for watching videos, web surfing, texting, gaming, group photos, Face Time, and Skype. Multifuctional expanding grips.removable adhesive,Pop, tilt, wrap, prop, collapse, grip, repeat – This stand are great for enhancing the grip and capabilities of your phone. This entry was posted on June 15, 2018, in Art. 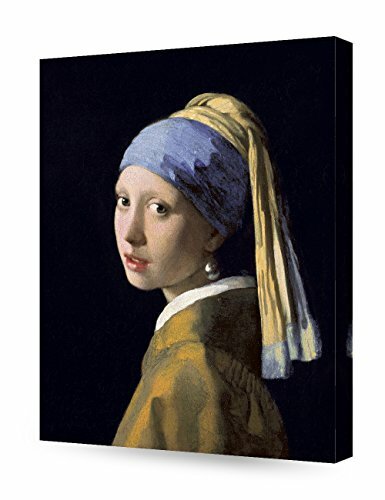 The Girl with a Pearl Earring is universally recognized as one of Johannes Vermeer’s absolute masterworks. After more than a century of study, the work still poses significant questions. Who was the sitter, and was the painting even intended as a portrait? Why had it remained in complete obscurity until it was rediscovered in 1882 and sold for the price of a reproduction? Was it a part of a pendant? Did Vermeer sell the painting during his lifetime? Why was the original background a deep transparent green rather than the black we see today? Was the pearl a real one? What significance did the turban have? Which painting procedures did Vermeer employ? Which pigments did he use? Art is a great status symbol in modern society. Because of that, it can be quite intimidating to the casual viewer. Art can be a great source of pleasure in our lives as well, and even a passing acquaintance with art can enrich our understanding of the world around us. It is an oil painting by 17th-century Dutch painter Johannes Vermeer. Known as “The North Mona Lisa”. Seems like a small painting. But people can”t take their eyes off it. What stirring their soul? Real handcrafted canvas prints produced and hand-stretched in California. UV-resistant colors. Real wood frame(Non-MDF)& Solvent-free Ink: odorless and can be used by someone with allergies and in kids’ rooms. For giclee printing, the canvas used to actually print the final piece must be of archival quality. it is acid free and consists of a 100% cotton base. Museum-quality pieces printed, non-fading vibrant, saturated colors for up to 80-100 years. Semi-Gloss Acrylic Coating applied to enhance appearance, protect, and preserve the artwork from dirt and dust, extending its lifetime and keeping it from fading. 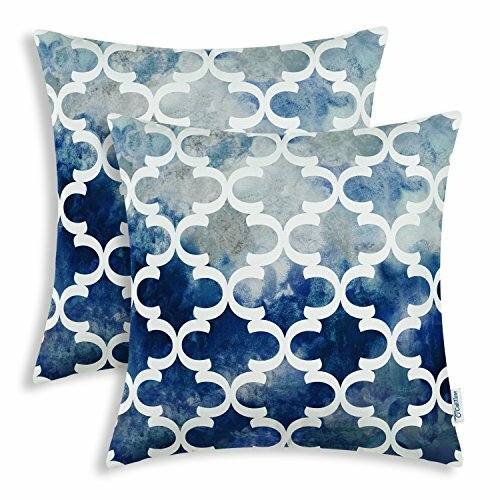 Brand Quality: production from one of the world’s leading wall decor manufacturers, DecorArts a registered Trademark. Made in the USA. This entry was posted on June 15, 2018, in Prints. 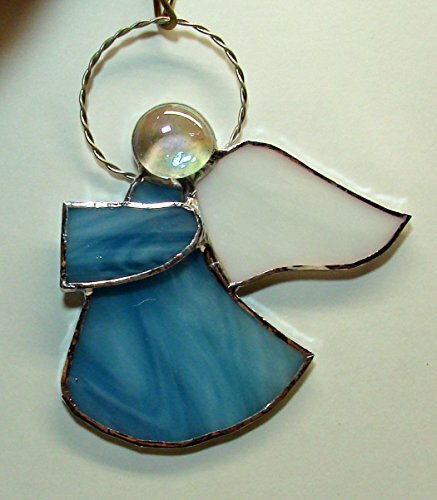 I handcrafted this angel with a a gorgeous piece of glass called Blue Yonder that has swirls and wisps of blues and white. The wing is made from a white wispy glass, the head is a clear iridescent glass nugget and the halo is hand braided copper wire tinned with lead solder. She can be used as a Christmas ornament or hung in a window all year long. I have this angel in other colors or can make one to order. This entry was posted on June 15, 2018, in Jewelry. WHY USE PRODUCT OF HANDMADE JEWELLERY ? This design carries a combination of various symbols all associated with the Norse All Father God, King of Asgard. In the center of the back is the “Valknut”, three interlocking triangles which translates as the “Knot of the Fallen”. To bear this mark signified that the wearer had dedicated their life to the service of Odin and upon death would be carried by his servants, The Valkyries in the form of raven to Valhalla to feast until Ragnarok [the end of time] when the warriors would all emerge from the hall to fight the hell beasts. 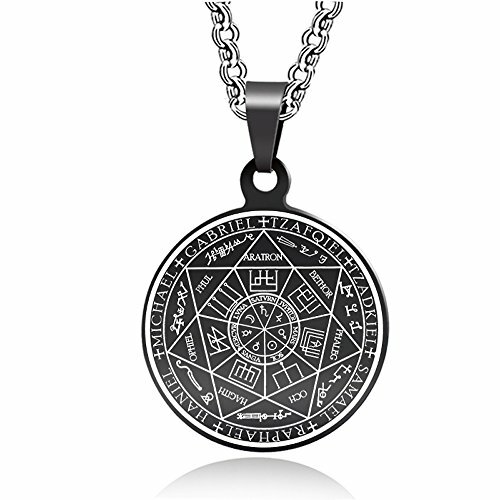 An original design by Kano Diebitsch, this pendant brings a reopening of the spiritual life urging inspiration to achieve victory over the transient material things and the ego, bringing courage, wholeness, and the divine energies of Odin, leading one to bond with the energy in their heart, not in the ‘out there’. We are droplets of god, and an essential part of everything. May these runes empower and protect the wearer to this path. ✅ Antique Sterling silver plated, nice and unique. US:free size. ✅ This is one of the symbols of the annual rotation of the solar disk. ✅ Perpetual motion, the continuation of life and the infinity of the universe. ✅ Metal: Stainless Steel is robust and will not tarnish or rust easily, it is easy to maitain and ideal for long-lasting jewelry designs. ✅ 100% Guarantee: we will return every penny if you don’t absolutely love your kit. 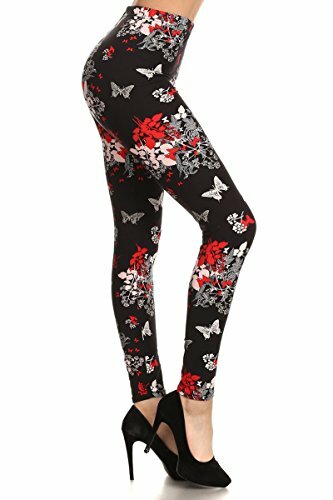 Click ‘Add to Cart’ and ‘Buy now’ ! Add this pair of mercury glass table lamps to your bedroom, office or living room for a dash of delightful symmetry and visual allure. A classic drum shade pairs perfectly with the rounded form, striking a beautiful aesthetic balance. The blue mercury glass finish creates a sense of aged appeal. Use the 1 amp USB port to charge your devices in style. – Set of 2 lamps. Each is 21 1/2″ high. Round bases are 5 1/4″ wide. Shades are 9 1/2″ across the top x 10 1/2″ across the bottom x 9 3/4″ high. Each weighs 3.3 lbs. – Blue mercury glass table lamps with USB ports. 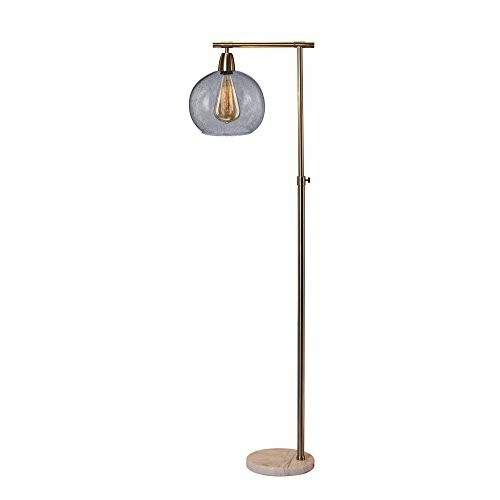 A modern look from the 360 Lighting brand. – Each lamp has one 1.0-A type USB port in the base. 1 amp. – White tapered drum shades. Round metal bases. Clear cords and plugs. Set of 2 lamps. Each is 21 1/2″ high. Round bases are 5 1/4″ wide. Shades are 9 1/2″ across the top x 10 1/2″ across the bottom x 9 3/4″ high. Each weighs 3.3 lbs. 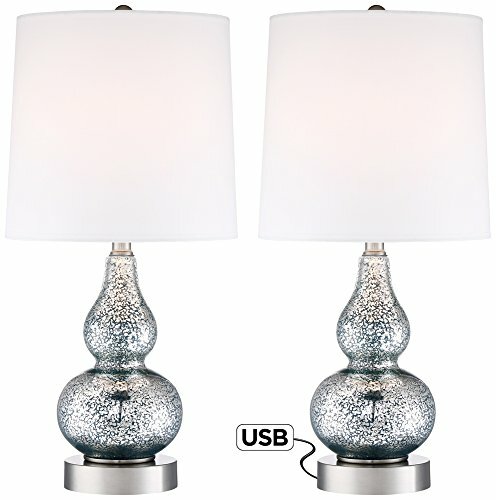 Blue mercury glass table lamps with USB ports. A modern look from the 360 Lighting brand. Each lamp has one 1.0-A type USB port in the base. 1 amp. White tapered drum shades. Round metal bases. Clear cords and plugs. This entry was posted on June 15, 2018, in Sculptures. The Bridge over the Water Lily Pond (1914), by Claude Monet. After he purchased a property at Giverny in 1893, Monet transformed the soft and wet land behind his home into a pond, and he built a Japanese-style wood bridge. The artist produced a series of sensational paintings on water lilies and with many designs that he painted during 1899 to 1900s. The term, Giclee printing, is a process uses fade-resistant, archival inks and archival substrates to print by large professional or industrial printers. Giclee printing is mostly used by artists to make reproductions of their original artwork, photographs, or computer generated art for resale while preserving the original. A canvas is stretched over a “stretcher bar” and “stapled” to a wooden frame. Then, it may be framed or just left as it is with the stretcher bar with a basic, exhibition-like look. Stretched paintings/prints are brighter, sharper, and less likely to be vulnerable to dust and damages. 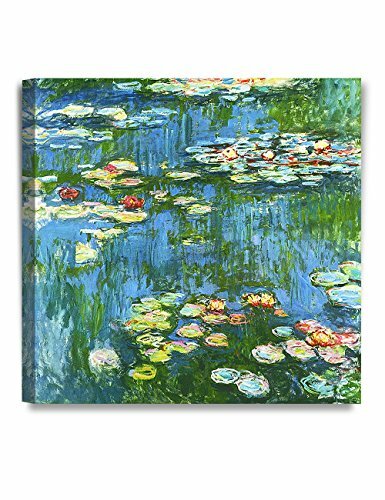 As Monet’s well-known paintings, this series of Water Lillies arkworks regardless of skills or theme all reflect an important turning point for Monet’s composition period. This entry was posted on June 15, 2018, in Glass. 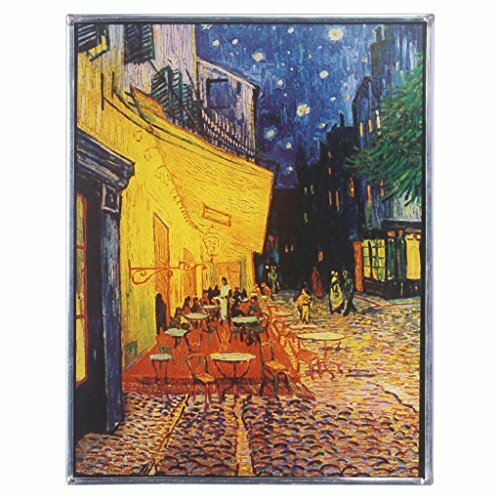 Van Gogh loved painting a “night without black, a night studded with stars.” Living and painting in the Arles, France for a period of ten years he produced several fantastic paintings of night studies. In this masterwork, an immense yellow lantern sheds its warm glow over the patrons of the coffee house in the Place du Forum, shading the cobbles and shops with just a glimpse of the starry night sky. Art glass, also called stained glass, is created by a unique technique of fusing hand-rolled architectural glass with unique transparent enamels, then kiln fired at temperatures above 1100 degrees Fahrenheit so the colors actually becomes part of the glass. The shades and hues will stay bright and glowing with radiant color and provide a stunning view from either side. Our Design Toscana art glass window is framed in zinc with a hanging chain for window display and a tabletop easel stand to enjoy this treasured piece in any room. 7″Wx9″H. 1 lb. HIGH-QUALITY WINDOW TREATMENT – Design Toscano’s framed art glass windows pay homage to the artist originals with each individual enamel layer fired onto hand-rolled small glass art sets and then framed in zinc, taking our artisans many hours to craft each stained glass panel by hand. DESIGN TOSCANO STAINED GLASS PANEL – This handcrafted Tiffany stained glass window, sold by the Design Toscano brand, has been kiln fired at temperatures above 1100 degrees Fahrenheit so the color enamels actually become part of the glass. This art glass window is guaranteed to NEVER fade! PERFECTLY SIZED VINTAGE WALL DECOR – Measuring 7″Wx9″H. 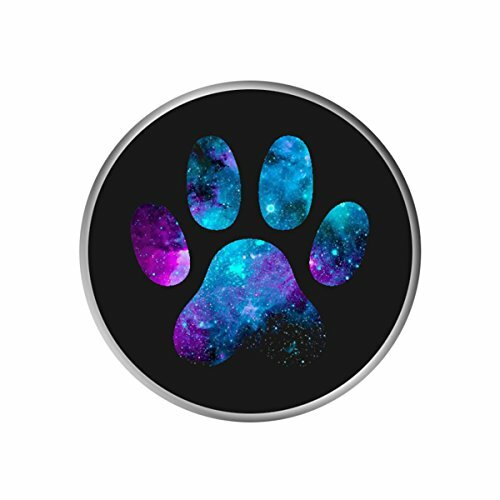 1 lb our hanging wall decor inlcudes a chain for hanging and a translucent tabletop display stand making this home decoration easy to display, acting as a sun catcher in your home decor.